Heading the compliance modeling team (the team size of 25 members at different levels such as Business Analyst, Senior Analyst and Team Leader Level) and managing the process such as compliance modeling of structured products viz, CDO, CBO, CLO and RMBS in the WSO platform. Worked as an on-site Manager, Capital Market and Treasury, Financial Strategic Division, SHINSEI BANK, TOKYO, JAPAN. Designation: Manager, Investment Research-Quantitative Finance and Risk Management, Evalueserve.com Pvt. Ltd, Gurgaon. Heading the quantitative research wing and managing (the team size of 15 members with different capacity such as Business Analyst, Senior Business Analyst) the project on credit risk modeling such as modeling of EDF, LGD, Recovery, Cumulative Expected Default Frequency, Default Density of credit portfolio, Hedge Fund portfolio, Insurance portfolio, Quarterly CDO analysis, Bank valuation, Systematic risk modeling and valuation of securitized products of a large multinational investment bank in Japan. The other project includes market risk management, valuation of structured products and volatility forecasting of equity, currency and commodities. Designation: Research Officer, Money International Banking and Finance, National Institute of Bank Management, Pune. Ph.D. (Economics) University of Hyderabad 2007 Awarded. M.Phil. (Economics) University of Hyderabad 2001 First Class. M.A. (Economics) University of Hyderabad 2000 First Class. Basic Statistics and Econometrics (M.A. Programme). Urban Economics and Policy (M.A. Programme). Fixed Income Securities, Debt Markets and Macroeconomics (M.A. Programme). Financial Derivatives and Risk Management (M.A. Programme). Macro Economics (Integrated MA Programme). Indian Economics (Integrated MA Programme). Advanced Economics (M.Phil and Ph.D. Programme). Impact of Information & Communication Technologies on Rural livelihoods in Selected Districts of Andhra Pradesh: An Analysis of Economical, Social and Financial Perspectives, UPE, UGC, 2013. Transmission mechanisms between financial and real sectors: A simulation analysis using a financial macro econometric model for India, UPE, UGC, 2013. Quantitative research & modeling support for portfolio management & risk analysis for a large scale investment bank in Japan. Total Shareholder Return (TSR) analysis for a large scale consulting firm in Europe. Database creation of the constituents and their monthly historical weights of selected global equity market indices for a large scale equity focused trading firm in USA. A study on price volatility of natural gas for a large international energy company in Europe. Developing a macro econometric leading and a lagging indicator model to forecast the retail sales (apparels and foot wear sales) for a large scale asset management firm in USA. Technical analysis reports on selected stocks and indices for a large scale asset management company in UAE. Developing a validation model for an existing technical analysis application for a software company in Johannesburg, South Africa. Cash flow modeling of Residual Mortgage Backed Securities (RMBS) for a large scale investment banks in Japan. Time series analysis and designing an excel macro using VBA for a large scale private equity firm in UK. Credit appraisal and credit memos of 200 selected global banks for a large investment bank in Dubai. Workshop on ‘Credit Risk Modelling & Pricing of Credit Derivatives’ for the banking analytics KPO, Epitome Global Services, Mumbai on December 1-2, 2006. 4-Day Programme in ‘Managing Non-SLR Investment Portfolio’ (November, 7-10, 2005, March7-10, 2006, November, 7-10, 2006; NIBM, Pune). 3-Day Programme in Financial Economics and Financial Econometrics for Risk Managers, (August, 7-9, 2006; NIBM, Pune). A Two Day Workshop on CSO-NSSO Database and Scientific Research Writing, APRIL 28- 29, 2014 at School of Economics, University of Hyderabad. Cities and Agglomeration Externalities: Lessons for Urban Public Policy in Asian Countries, Joint author with P. K. Mohanty, Environment and Urbanization Asia, 5, 2 (2014): 1–17, Sage Publication. “Integration and Efficiency of Stock and Foreign Exchange Markets in India”, Joint Author with Thomas Paul, EUL Journal of Social Sciences, European Unıversıty Of Lefke, North Cyprus, Vol.1, No.1, 2010 Issue. Causal Nexus between Stock Price, Demand for Money, Interest Rate, Foreign Institutional Investment, and Exchange Rates in India: A Post Subprime Crisis Analysis, Co-authored with Prof. Narayan Prasad and Iti Vyas, Indonesian Capital Market Review, Vol.III, Issue 2, July 2011,Pp. 81-100. An Equilibrium Approach for Tactical Asset Allocation: Assessing Black Litterman Model to Indian Stock Market", Joint Author with Subramanyam Pisipati and Iti Vyas, Journal of Economics and International Finance, Vol. 3(10), September 2011, Pp. 553-63. “Networth Exposure to Interest Rate Risk: An Empirical Analysis of Indian Commercial Banks”, Joint author with Asish Saha , V. Subramanian , Sanjay Basu, European Journal of Operational Research, Vol.193, Issue, 2, March 2009, Pp.581-90, Elsevier Publication. “Volatility Spillover between Stock and Foreign Exchange Markets: Indian Evidence” Joint author with Niranjan Swain, and D.K. Malhotra, International Journal of Business, Vol. 12, No. 3, Summer 2007 , Premier Publication, U.S.A.
“Stock Market and Foreign Exchange Market in India: Are they Related?” South Asian Economic Journal, Vol. 5, No. 2, July/Dec., 2004. Nexus of Financial Development and Economic Growth in India: Revisiting Schumpeter? , Joint author with Bhanu Pratap Singh, Indian Journal of Economics and Development, Vol-10, Np.3, July-Sept 2014. Is there any Crucial Relationship amongst Energy Commodity Prices and Price Volatilities in the U.S.?, International Journal of Quantitative and Qualitative Research Method, Vol.1, No.1, pp.11-40, September 2013, Published by European Centre for Research Training and Development UK. Looking into the Relationship between Implied and Realized Volatility: A Study on S&P CNX Nifty Index Option, Co-authored with S. P. Panda, Accepted for publication in the Eurasian Economic Review, Springer publication, 2015. Information Content Volatility for Indian S&P CNX Nifty Index Option, Co-authored with Siba Prasad Panda, Communicated to Decisions in Economics and Finance, Springer, 2014. Is Global Financial Crisis Integrates the Regional Market in Asia more Strongly?, Co-authored with Dr. Iti Vyas, Asia-Pacific Financial Markets, Springer, 2014. Money, Output and Prices in India: Causality Issues and Evidences in Post Liberalization Period”, Indian Journal of Economics and Business, Vol.-1, No.-2, December-2002. “Revisiting Monetary Policy Perspectives in India During 1990s”., The ICFAI Journal of Applied Economics, Vol-III, Number-2, March-2004. “Interlink ages of Stock Price and Exchange Rate in India: A Note.” Joint Author with Jigisha Thakkar, Indian Journal of Economics and Business, Vol.3, No. 2, December –2004. “Stock Price and Exchange Rate Interlink ages in Emerging Financial Markets: The Indian Perspective”, ICFAI Journal of Applied Finance, Vol.11, No.4, April 2005. Event Study Analysis: Theory and Evidence From Indian Pharmaceutical Industry, Joint author with Bhanu Pratap Singh, in the edited book “Corporate Finance and Financial Services: An Emerging Trends”, Spectrum Publications, Hyderabad, April 2014, ISBN: 13 978-93-82829-42-3. How Good is Merton Model at Assessing Credit Risk? Evidence from India’, 2011, VDM Verlag Dr. Muller GmbH & Co. KG Publication, Germany, ISBN:978-3-639-32634-5. ‘ ‘Linkage Dynamics of Indian Financial Markets: A Theoretical and Empirical Perspective’, 2011, Joint Author with Iti Vyas, VDM Verlag Dr. Muller GmbH & Co. KG Publication, Germany, ISBN: 978-3-639-34442-4. Presented the paper entitled “On the Dynamic Interaction between Stock and Foreign Exchange Markets in India: A VAR Analysis” in the National Seminar on “Emerging Trends in International Trade & Finance, 2003” organized by Confederation of Indian Industry (CII) in Osmania University, Hyderabad. Presented the paper titled “The Dynamic Interaction between Stock and Foreign exchange Market in India: An Application of VAR Model” in the National Conference COSMAR 2003, Department of Management Science, IISC, Bangalore. Presented the paper titled “Stock Price and Exchange Rate Interlink ages in Emerging Financial Markets: The Indian Perspective” in the International Conference on Business and Finance 2004, organized by ICFAI University, Hyderabad and PHILADELPHIA University, USA. Participated in the workshop on “Econometrics of Financial Markets and Banking: Theory and Practice” held from January 3rd to January 8th, 2005 at Indira Gandhi Institute of Development and Research, Mumbai. Accepted the paper titled “Volatility Surprises between Stock and Foreign Exchange Market in India”, in a presentation at the 2006 Southern Finance Association meetings to be held at the San Destn Hilton in Destin, Florida, November 15-18, 2006. Presented the paper titled “How Good is Merton Model at Assessing Credit Risk? Evidence from India” Joint author with Dr.Amit Kulkarni and Jigisha Thakkaer in The Eighth Annual Conference on Money and Finance in the Indian Economy, March 27th and 28th 2006, IGIDR, Mumbai. Commodity Future Markets in India: Riding the Growth Phase, Paper presented and published in the International Conference on Commodity Futures, organized by the Associated Chambers of Commerce and Industry of India, New Delhi, January 2008. Opting out of Euro: Swedish Skepticism continues, Nordic BI conference, March 2009. The UK Petrol Market: Time to Intervene? Shared with Media community, June 2009. Participated in the 77th Orientation Course for Social Sciences Teachers in University Grant Commission Academic staff College, University of Hyderabad from 21st June 2012 to 18th July 2012. Participated in the Refresher course in Social Sciences in University Grant Commission Academic staff College, University of Hyderabad from 1st November 2012 to 21st Nov 2012. Presented the paper titled “Is there any Crucial Relationship amongst Energy Commodity Prices and Price Volatilities in the U.S.?” in the 9th Eurasia Business and Economics Society-Rome, Italy, Jan 11th to 13th 2013. Presented the Paper (co-authored with Mr. Bhanu Pratap Singh) on “Event Study Analysis: Theory and Evidence from Indian Pharmaceutical Industry”, in the National Seminar on Corporate Finance and Financial Services- Emerging Trends, February 14-16, 2013, School of Management Studies, University of Hyderabad. Presented the Paper (co-authored with Mr. Bhanu Pratap Singh) on “Whether Merger and Acquisition Creates Shareholders Wealth: A Case Study of Indian Pharmaceutical Industry”, in the 6th Doctoral Thesis Conference, April 26-27,2013, ICFAI Business School, Hyderabad. Presented the paper (Coauthor with Bhanu Pratap Singh) entitled as “Nexus of financial Development and Economic Growth in India: Revisiting Schumpeter,” in the 20th Biennial Meeting, jointly organized by the Association of Indian Economic and financial Studies and Indira Gandhi Institute of Development Research (IGIDR), Mumbai, August, 2-3, 2013. Presented the paper (Coauthor with Bhavanarayana Vedam) entitled as ““Revitalizing Local Governance in India: Convergences Amidst Contestations,” in the 20th Biennial Meeting, jointly organized by the Association of Indian Economic and financial Studies and Indira Gandhi Institute of Development Research (IGIDR), Mumbai, August, 2-3, 2013. Presented the paper (Coauthor with Bhanu Pratap Singh) entitled as ““Researching the Relationship between Financial and Real Sector in India: An Empirical Examination of Schumpeterian Notion” in the 4th International Conference on Applied Econometrics (ICAE-IV) organized by IBS Hyderabad in collaboration with The Indian Econometric Society on March 20-21, 2014. Presented the paper (Coauthor with Shruti Sharma) entitled as ““Reality of Financial Inclusion in India: A study of Warangal District in Andhra Pradesh” in the National Seminar on Economic Growth and Marginalized Groups: A search for Inclusive Policy Organized at the School of Economics, University of Hyderabad on March 24-25, 2014. Global financial crisis and monetary and fiscal measures taken by central bankers and governments worldwide”, February 2009, The National Investors, UAE. Price Volatility of Natural Gas in USA and Europe,StatoilHydro, December 2008. GCC Bond Market: Overview and Current Outlook, KPMG ,Dubai. Requested by Department of Economics, School of Social Sciences, Indira Gandhi National Open University, New Delhi to write two units of the course Indian Economic Policy (MEC-005) in regard to restructuring and revising the course. The written units of the course are as follows: Unit 14: Credit and Monetary Policy Unit 15: Capital Market and its Regulation. Handbook for Eviews Package for Quantitative Research, IGNOU, New Delhi. Security Analysis and Portfolio Management, Sinhgad Institute of Management, Pune, Maharashtra. Title: Labour Productivity and Distributive Aspects of Indian Manufacturing Sector Student:Sudhansu Mohan Sahoo, Date of Award: 21/01/2015. Title: Operation of the Financial System and Economic Growth in India Student: Arun Bikash Mallik,Date of Award: 24/09/13. Title: Does Inflation Matter for Economic Growth? Evidence from BRICS and Searching Threshold Inflation for India, Student: Jaganath Behera, Date of Award 19/05/14. Title: Value at Risk (VaR) for Market Risk Measurement: A Review, Student:Jitender, Date of Award:12/11/14. Delivered Lectures on Time series Modeling with specific to Energy Pricing in the ‘Training Program on Econometrics: Theory and Applications for Indian Economic Service Officers, Government of India, during September 19-28, 2011, School of Economics, University of Hyderabad in collaboration with The Indian Econometric Society (TIES). Delivered a lecture on Macro Finance Interface in the Refresher course in Economics, Academic staff college, University of Hyderabad on 25th October 2013. Delivered two lectures on the themes, namely, (1) Globalisation and Financial Crisis: Is it a Gain or Pain, (2) The Role of Social Scientists in the Globalisation Era on 24th February 2013 from 10am to 1 pm in the Refresher course in Political Science organized by the Academic Staff college, Utkal University, Odisha on the broad theme” Contemporary Issues in Global Politics” from 8th Feb to 28th Feb 2013. Delivered a guest lecture entitled as “Recent Economic Crisis and Short Term Macro Economic Challenges” in the St. Ann’s Degree and P.G. College, Mehidipatnam on 24th September 2013. Delivered two lectures on “Multivariate Time Series Models: SEM, VAR, SVAR, Impulse Response Functions” on 17th December 2013 in one week duration training programmes for the Senior Officers of the Department of Economics & Statistics, Government of Uttarakhand entitled “Time Series Econometrics and Forecasting Techniques”, scheduled for December 16 - 20, 2013 at the Administrative Staff College of India (ASCI) at Hyderabad. Chair the Technical Session III in a National Seminar on Econometric Applications for Managers on 16th Feb 2012, Organised by Institute of Public Enterprise, Hyderabad. Chaired a technical session on Growth and Development- I PN 11th Jan 2013 in the 9th EBES Conference – Rome, Italy, Jan 11-13, 2013. Delivered lectures on “ARIMA and ARCH/GARCH Modelling and their Applications in Applied Finance on 2nd and 3rd March 2012, in a Training Programme on “Application of Computers and Econometric Methods in Research Methodology”, 20th Feb 2012 to 04th March 2012, organised by Department of Economics, Jamia Millia Islamia University, New Delhi. Delivered four lectures on “Compensation Management and Economic Theory of Wages” to MBA students, School of Management Studies, University of Hyderabad on 16th February 2012. Chaired two technical session on Financial Economics, 4th International Conference on Applied Econometrics (ICAE-IV) March 20-21, 2014, Organised by IBS Hyderabad. Delivered a lecture on “The Global Economic Crisis and its Impact, Challenges and Opportunities for India: From Manmohanomics to Modinomics” at the South Asia Institute, University of Heiidelberg, Germany on 19th Nov 2014. Delivered a lecture on "Does Vertical Financial Integration Boost Economic Growth in India? An Empirical Analysis with Specific Reference to Economic and Financial Crisis" at the Department of Economics, Alfred Weber Institute for Wirtschaftswissenschaften, Bergheimer Street, University of Heidelberg, Germany on 5th Nov 2014. Delivered two lectures on “ Binary Choice Models”, and Time Series Econometrics Modeling” in a Training program entitled Economic Concepts Using Statistical Tools' for the Officers of the Directorate of Economics & Statistics, Dept. of Planning, Government of Uttar Pradesh, on Jan 28, 2015, organized by ASCI, Hyderabad. Delivered a couple of Lectures on “Financial Derivatives and Integrated Risk Management” in the Financial Economics Course of Actuarial Science Program of Institute of Insurance and Risk Management, An organization jointly constituted by IRDA and Govt. of AP, Hyderabad. Baden-Württemberg Fellowship Award at South Asia Institute (SAI), Heidelberg University, Germany, 2014. Awarded Quality Champion and Innovation Excellency, Investment Research, Evalueserve. com, India, June 2009. Executive Editor, International Journal of Economics and Business Modeling, Bioinfo Publications. Editorial Board Member, Asian Development Policy Review. European Journal of Operational Research, Elsevier Publication. Journal of Banking and Finance, Elsevier Publications. Apeejay Journal of Management and Technology. African Journal of Marketing Management. International Journal of Emerging Markets. International Journal of Finance and Economics. British Journal of Management & Economics. Prajnan, National Institute of Bank Management, Pune. Member of EBES (Eurasian Business and Economics Society) is a scholarly association for scholars involved in the practice and study of economics, finance, and business worldwide. Member, Indian Econometric Society, India. 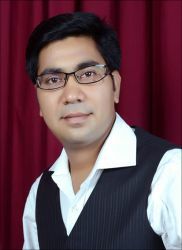 Member, Society of Economics and Development. Warden, Hostel – I, University of Hyderabad,Feb 2015 onwards. Executive Member, The University of Hyderabad Placement Bureau, 2013-14 onwards. Faculty Coordinator, Placement Cell, School of Economics, University of Hyderabad, 2012 Onwards. Faculty Observer, University Entrance Examination, 2013, 2014. Member, Equipment and Purchase Committee,School of Economics, University of Hyderabad, 2014. School Councilor and Member, University of Hyderabad Teaching Assocation, 2014-15. Member, Ph.D. Research Advisory Council, School of Economics, University of Hyderabad, 2013 Onwards.